I am a 2000 graduate of West Noble High School which was followed by attending IPFW from 2000 through 2005 at which point I graduated with an Associate's Degree in Architectural Engineering Technologies and a Bachelor's Degree in Construction Engineering Technologies. My real estate course study was acquired through Beer School of Real Estate in December of 2011 at which point I officially became a real estate agent. In February of 2014 I passed the state exam and am now a licensed Broker. I have 20 years of experience in the residential construction and design fields which include building new homes, additions and outbuildings. My designs have also been used for new home construction, additions and remodels. These tools are available to clients and customers to help them envision their new home. From 2010-2011 I served on the Noble County Planning Commission and learned the process of county development and land usage. From 2011 to 2013 I served as a member of the Noble County Board of Zoning Appeals which furthered my understanding for the highest and best use of real property. I am currently a member of the Albion Chamber of Commerce where I work at staying involved in the local community. 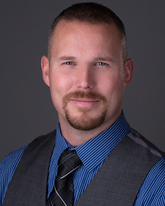 I am ambitious and enthusiastic about serving the Northeast Indiana markets with all their real estate needs. Kaleb and Misty Walker Darlene is always accessable, great at her job, even helped us after the sale of our home. Loved working with Darlene! Christopher Banks Ann was amazing and wonderful to work with. Kevin was very knowledgeable and also wonderful to work with. Max Kritzman Jill was awesome! The perfect balance of aggressiveness and laid back communication. Matthew and Christie Browning Eric did an excellent job, we can't think of anything that wasn't handlesed very perofessionally and above the call of duty. Greg & Kari Gentry I definitely would work with Kevin in the future. He is a good sales person and I had very good service.